In September, M.E.L.T. will be playing a benefit concert in Frankfurt for a German girl named Samiera. She suffers from Canavan Disease. Marcus is hoping to raise 20,000 deutschmarks, or $12,000.00, to assist Samiera's family with the cost of Dolphin Therapy. 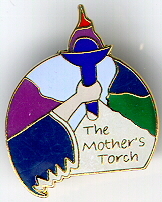 The US Wing of The Mother's Torch is selling enamel lapel pins for $8.00. $5.00 from the sale of each pin will be donated to Samiera, $3.00 will cover the cost of the pin and shipping and handling. (Cost for international shipping is a bit more, and will be added onto the price.) The pins are 1 1/2" tall, a bit smaller than the pic above. We hope to sell 100 pins, earning $500.00 for Samiera. To pre-order pins, please email Jan for more information. The pins will be shipped in early October, after Jan's return from the Homeland convention in Scotland.